I’ve been dying to make a batch of Scotcheroos for a long time and although I’ve become pretty adept at finding substitutions for American ingredients here in Paris, butterscotch chips had me scratching me head. At the Publix supermarket conveniently located just across the street from our hotel in Lawderdale (I had to teach Romain how to say Fort Lauderdale that way, for reasons that he didn’t understand), I stocked up on everything I could. Bandwith constraints don”t allow me to print the complete list—nor does customs, but there was everything from chiles to chapstick crammed into my suitcases. I also managed to bring back a suitcase full of cake pans (which, in an accidental typo, I just typed as “suitcake”), in every conceivable size from a nearby Ross store, where I almost had to call the store maintenance crew to pick up Romain’s eyeballs when they practically fell out of his head when he say how cheap the cookware was there. So armed with a battalion of shiny new bakeware, which included a 11 x 17-inch pan, as well as a bag of butterscotch chips, I was ready to go. And although the butterscotch chips probably make me a persona non grata with the health police, anticipating the avalanche of arrows if I dumped a whole cup of corn syrup into a recipe, I prudently used rice syrup in place, which worked great. I’m not sure if agave nectar or other liquid sweeteners would work and I wouldn’t use honey since the flavor is too strong, but you can give others a try. Or you can throw caution to the wind and use Karo syrup, one of the few things I didn’t bring back. Which was a good thing, since the three bottle of molasses I did pack in my suitcase didn’t arrive in the same pristine condition as the butterscotch chips did. I think there’s clearly a market for molasses in chip form. And I hope they’re available in time for my next return visit to the states, because like butterscotch-flavored chips, I don’t expect to find those anytime here in the near future either. Adapted from the original Scotcheroos recipe.Because Rice Krispies are available in France, I didn’t bring any back with me. But my usual refrain was true: the supermarket here had everything but what I was there to buy. Except I scored some chocolate rice cereal, which tilted my Scotcheroos into the “triple chocolate” category, so I’m not complaining.The original recipe doesn’t have Nutella in it so if it’s not available, just use peanut butter in its place. I’m sure you could replace the butterscotch chips with chocolate chips, although the flavor and spreadability will be different. 1. Butter or spray a 9 x 13-inch baking pan. 2. In a large saucepan (at least 6 qts) over medium heat, bring the sugar and rice or corn syrup to a full boil. 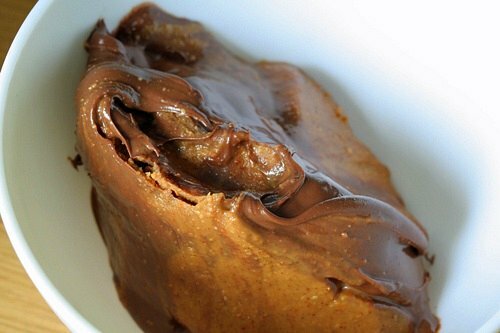 Remove from heat and stir in peanut butter and Nutella, then mix the rice cereal in until completely coated. Press the mixture into the greased pan, making sure the top is smooth. 3. Melt the chocolate and butterscotch chips together in a clean, dry bowl set over a double boiler or microwave, stirring gently until smooth and well-blended. Spread over the rice cereal mixture, sprinkle lightly with salt (if using) and cool until set. Serving: Once cool, cut into small bars with a sharp knife. These are pretty intense and certainly on the sweet side, so bite-sized portions are in order. Strong cups of espresso are nice to balance them out. *I presume the original recipe was meant for commercial-style peanut butter, although they don’t specify smooth or chunky. Still, I didn’t want to let go of my precious last jar of organic extra-crunchy stuff from the states, so I used the coarsely-ground unsweetened brand shown in my post, Peanut Butter Cookies with Salted Peanut Caramel. I believe that natural-style peanut butter available elsewhere would work. (The label noted it was 98% peanuts and 2% emulsifiers.) Let me know in the comments if you do experiment. On Another Note: I was featured in a terrific article in the New York Times this weekend, with my variation on Maida Heatter’s all-American popovers, which got a makeover as nifty, and delicious Sugared Puffs. I’m not sure that I’d ever make this recipe, not having any children around the place these days (maybe if and when I have grandchildren! 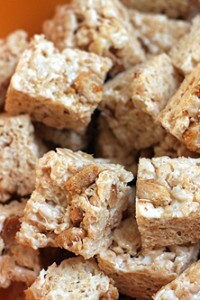 ), but how lovely to see a recipe for rice-krispie cakes that doesn’t involve the dreaded golden syrup, which I dislike! wow-the nutella in this looks divine! i made something similar using just peanut butter (smitten’s recipe) i’ll have to try this next! have a great weekend! OMG, I need these right now. They are beautiful, look delicious. Thank you! 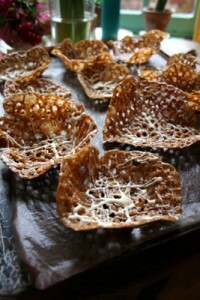 These look awesome, although I’m actually hankering for the popovers from the article which I read the other day. Those sound totally awesomely delicious too. Thanks for making life sweeter David. Looks so good! I can’t pass up a desert made with Nutella. Sorry, I screwed that up. I would love to know how your French amis react to these highly American treats. This is too funny! We do the same thing whenever we travel to a large city with Trader Joe’s and real wine stores. Usually we end up shipping several boxes back to ourselves and stuffing our suitcases full of the necessities like peach salsa, buffalo jerky, and Valrhona chocolate! 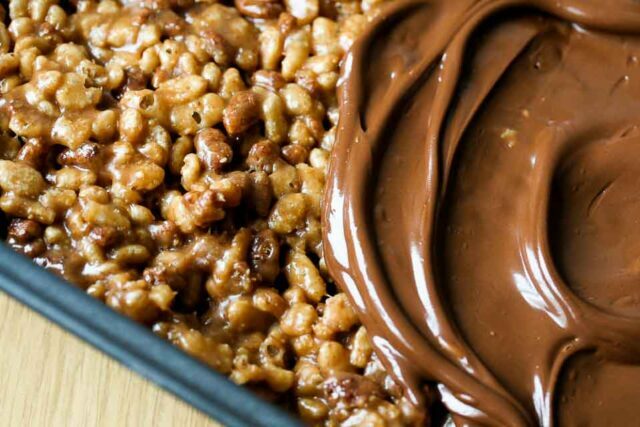 Adding nutella to these scotcheroos looks both divine and dangerous at the same time! The sugared puffs look great, too! Will something bad happen (besides to my waistline) if I increase every ingredient by 1/3 to fill all 12 spaces in my muffin tin instead of just 9? On a whim I stuffed a vanilla bean into a 2 oz bottle of Glenlivet. Now I have butterscotch extract. Maybe you could sub white chocolate and a tsp or two of butterscotch extract. Your mishap is exactly why anything liquid goes in a ZIP TOP BAGGIE, even in my suitcase. I’ve more than once found said baggie filled with liquid… in fact, if I have time, I’ll vacuum-seal bottles with my kitchen unit (doesn’t work for the trip home, though). I love your blog, and your recipes are divine. You remind me how much I miss life in l’hexagone. I’m about to try your popover recipe from the New York Times, but I was wondering if you’ve ever experimented with different types of flour? Popovers are a staple of the Jewish holiday of Passover, so I was wondering how to keep them light and airy if I substitute matzo meal for the flour. The nutella is a fabulous addition. I would never remove the butterscotch chips from the topping, but have found the combination of equal parts semi-sweet chocolate, milk chocolate, butterscotch and peanut butter chips to lead to superior flavor and spreadability. Lent seems to be getting longer by the day! I looked at the sugared popovers and they reminded me of something I’ve made for my kids for twenty years. We call them ducktails; just Crescent rolls, wrapped around a large marshmallow, then rolled in melted butter, sugar and cinnamon. Drop them in a muffin tin and bake at 400. The marshmallow melts and leaves a sticky sweet cavity like a popover. They really are like fine pastry. You should provide a post office address so we could send you care packages of butterscotch bits and so on. Ah, but then you would have to send us pastries or something. Ok make that double foodgasm. I know the feeling about traveling back with all sorts of difficult to find ingredients. I move around the world a lot and I’m always searching for something…right now I need to find corn syrup in a little island in Brazil. I’d be more than willing to keep you supplied with butterscotch chips, if you could keep me supplied with Valhrona chocolate. Slip each bottle into a sock. Clean, dirty, doesn’t matter — your feet are happily, just about the same diameter as, say…a wine bottle, so your socks won’t get stretched out, either. Slip each socked bottle into a small garbage bag. If it’s a really small bottle, you can use a ziplock, but wine bottles don’t fit into large ziplocks. So it’s a small garbage bag. Wrap the bag around the bottle/sock, and secure with packing tape. Now pack your bag — layer of clothing, layer of bottles. layer of clothing, layer of bottles. Repeat as necessary. In 15 years of hauling stuff back and forth across the Atlantic, I’ve lost ONE bottle — and that was when the guy delivering our luggage (we got separated from it in Atlanta) threw our bags against our stone steps — we heard the shatter, and immediately unwrapped everything in the bag — we caught it so fast that the sock wasn’t even completely red yet. But on that one we lost ONE sock. Oh well. not that I’ve carried back more stuff than I was supposed to…but we declared every last bit of it. Well, you can never go wrong with Nutella, that’s what I say. But it is so funny that you first check out grocery stories. I thought I was the only weird one who did that. Glad to know I am not alone! well the last time I used a recipe from you it was perfect…so I must give this a go too. Great recipe!! Thanks for giving me something interesting to make for one of the desserts I need for my in-laws anniversary brunch next weekend. Also when you hit the American supermarkets and are buying liquid-y stuff like Karo, etc., don’t forget the plastic zip-loc bags to put stuff in and save the mess in the suitcase. the popovers look wonderful… how long do you think they’d keep? i’d love to make them for a party. Today I bought the ingredients to make traditional Krispie squares for St. Pat’s Day – I’m going to add a little green food coloring. I’ll have to use the rest of the cereal to try your recipe. It looks delish! Keep those restaurant & bakery recommendations coming. I’ve been forwarding to my niece who’s studing in Angers. She’s ready for spring too. Maybe my favourite DL post ever: love, travel, chocolate – what more could we want? The article in NYT brought me to your blog. Can’t wait to try your sugared puffs! I’m sure my husband will love them. BTW, where’s the recipe for the ginger cake mentioned in the NYT article? I hear you on the stocking up — I do the same whenever I visit the States (from Canada, where we don’t get half the cool stuff available to our southern neighbours). I recently cursed my inability to smuggle back some Bud Lime and Powerade Zero (not to mention Boca Burgers and Fage). Out of curiosity, how did you get the molasses off the suitcase? These look incredible! I will have to make them soon! Holy cow, these look perfect – as if i’m not already obsessed with Baked pb and chocolate bars, these raise it up a notch. Will need to try soon! If you want to go to supermarket heaven, you need to visit one of the big Wegman’s markets. Wegman’s originates in Rochester NY, but now extends down through NJ and PA.
Fresh Market and Whole Foods cannot compare in price nor quality. Hey! You can stay with me if you are enticed. You are soooooooo lucky to live in Paris. Love anything with Nutella. Great recipe for those of us who can’t eat wheat or dairy! Can’t wait to try it. David, if you loved Ross, you will love, _______ & ______. I’m sorry, I simply can’t bring myself to divulge the names of those two stores. I’m afraid it will cause a frenzie of activity and I’ll be running and bumping into too many shoppers. P.S. Marshall’s … TJ Maxx. But keep this under your hat, will ya? Did you lick the suitcake? The molasses one? I made some of Smitten Kitchens hot fudge sauce; It’s really thick. Do you suppose I could use it in the place of the Nutella? I’m not a hazelnut fan. 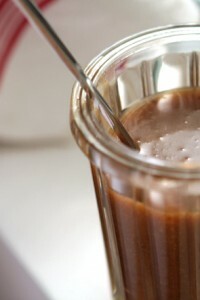 Might I also use some really thick caramel sauce instead of the butterscotch chips? that looks so devilishly good!!! im heading to the supermarket tomorrow! Those photos are obscene. You should be ashamed. Oh wait. You live in France. Never mind. Susan: I don’t know if it would work. I would stick to 100% peanut, or another nut butter, instead. Margie: I do know those other stores, but there was only a Ross around. But yes, TJ Maxx has some pretty great things in their cookware aisle! Pat: I’ve been to Wegman’s and it is a great store, but since I was in Florida, Publix was the best option. The other was the Winn-Dixie, which was pretty grimy…and much more expensive, too. M in Hawaii: That recipe is in my first book, Room for Dessert. It’s out-of-print, but you can find used copies and there’s talk of a re-issue in the future. The thought of eating one of these scotcheroos makes my teeth hurt. I mean that in a good way. I have a friend flying in from LA this month and she asked me what I’d like her to bring me. I asked for a candy thermometer, szechuan peppercorns and measurement cups. Barbra: Plenty of very strong espresso shots are, in my opinion, obligatory to serve with these! Murasaki: I’ve never had trouble finding Sichuan pepper in Paris at Asian markets. In fact, when it was temporarily banned in the US, it was still available in France. Hey David I love whatever you do-it’s always so interesting and so amusing. And by the way those sugared puffs sound like a delicious take-off on donut muffins. I love popovers, but I’ve never tried a sugared one. Have you tried sopapillas–the Southwest fried and sugar/cinnamoned bread? Traditionally, honey is poured into the hollowed-out center as soon as the red hot little packages can be handled to tear off one corner. Everything I love in one recipe. I can’t wait to try this. When were you in Ft. Laud? I adore Publix and usually find something, ok, many things, to bring back home. Before the airline restrictions, I used to buy bottles of Silver Palate Mustard Dill Sauce (great on salmon) and bring them home in my carry on…prices are great and it’s a real pleasure to shop in a spacious, well stocked supermarche. Did you try the Black and White’s from their bakery? Better than any I’ve had in NYC! C’est vrai! Ross is another gem. Sometimes you find extraordinary items and sometimes it’s just crap. I always find great, albeit, breakable things at TJ Maxx and Marshall’s so I’m starting another dish/glass collection chez ma mere. Was your hotel near Commercial Blvd.? Oh, and Lindsay Shere is awesome! You had a wonderful mentor! I love that even in the land of gorgeous French sweets, you’re man enough to confess to feeling the lure of the Scotcheroo. Knowing you are surely feeling, “what vacation” by now….I will tell you the sun is FINALLY shining in Southern Andalucia! You were not alone in this horrid winter. Whilst you were off having just the greatest time in The Carib, I was peeling and chopping Ginger for one of my favorite double ginger cookie recipes. OF COURSE I used your candied ginger recipe as you always provide the bestest and fastest way to do the thing. SO. Made the ginger for the first time in my life,,,,,and I’ve been cooking 50 years. As always with your recipes, a total success. QUESTION, I’m half Scot…what ideas do you or your readers have for the liquid left over? I’m thinking, to use as flavor for my natural tisanes, adding to another vanilla cookie, adding to some kind of fizzy water…etc. Anything out there better, surely there is! Thanks ahead if I get any reply. DH and I always travel with a stash of neoprene wine carriers (“Built” brand or a knock-off) in the luggage. They are perfect for bringing wine home in or, depending upon the circumstance, flavored oils and vinegars, Asian sauces (whether in glass or plastic bottles), whole Batali salume products, cinghiale sausages, jars of honey or confit de canard (you can usually stack two or three to a side of the carrier), jars of spices (four to a side) or a couple pounds of artisanal linguine. If the bottle or jar is small, we pack it in a ziploc bag first (we travel with about a dozen of them in various sizes at all times for just such occasions). The neoprene carriers come in a number of sizes and shapes that can be adapted to any purpose (the “six pack” holder is good for spices or smaller jars). They pack nice and light for the trip “to” or can carry a bottle of wine for our host and then can be loaded up for the return. I pick them up at Marshall’s or TJ Maxx for between $5 and $10 apiece. They make great host or hostess gifts for wine people. Oh I love Publix!!!! I miss all the Ross/TjMaxx stores now that I’m in Canada. Their version, Winners, doesn’t come close to being as great as TJMaxx. And the Dominion (now Metro) grocery stores make me long for Publix. This looks delicious as usual, David! Just finished making the popovers out here in Inverness (CA). Going over well with the boys upstairs watching the Giants game. Very familiar–a popover morning bun!!! Classic East Bay fare!!! PS–Does Amanda Hesser really think you don’t know Maida Heatter?? This is where you realize you’re old enough to get all the cultural references and inside jokes in the New Yorker and such…..
David, just made your Scotcheroos. Love them! Pure and simple, easy to make and darn right tasty. Sweet yes…but with a strong beverage like espresso, pure heaven. We fell in love with Nutella when we were in Paris last spring and I’ve been looking for recipes that I could use it in. I used the rice syrup and would love to know how to use it in other recipes as a substitute for other sweeteners. Thanks. I love the idea of using nutella in scotcheroos. Yeah on the rice syrup! I switched to using it in recipes that call for Karo several years ago. I think it works fab in Scotcheroos (I blew my French ex-pat’s friends’ minds the first time I made these for them). I love your riff with the Nutella…I will try that..maybe this week! 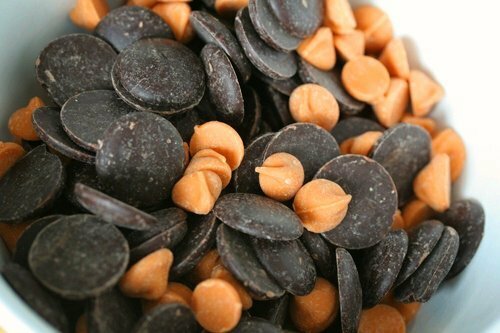 Because of the gluten in butterscotch chips, I just use a whole bag of semi-sweet chocolate chips. Don’t miss the butterscotch! Also, when I use brown rice syrup for pecan pie, I think it lessens the excessive, teeth-hurting sweetness that Karo puts in the pie. I so desperately want to try the popovers, but wonder how long they keep–can I make them the night before and serve them the next morning? Or do they get hard or gunky or something else somewhat scary if not eaten relatively quickly? Thank you, love you! Maureen: I think these days, you have to ask! As she mentioned, with all the tv chefs dominating, some of the classics (like Maida) aren’t so well-known as their contemporary counterparts. I love her and the hand-written letter she sent me really is in my desk drawer…still! Janet: You can use Heidi’s nifty Super Natural Search Engine, which should yield additional ideas for using rice syrup. Julialuli: I didn’t know that butterscotch-flavored chips had gluten in them. It’s not my area of expertise but the Publix-brand which I used, I didn’t notice any wheat products in the list of ingredients–although I know sometimes they’re hidden. Ok David, I get it. In order to be a pastry chef, one must be a man. How else can someone wear that camuflauge number while feasting on butterscotch scootheroos? It’s against the laws of physics. Did you know that Hershey’s makes cinnamon chips? You should pick some up the next time you’re in the US. Sometimes you just gotta have the real thing; I understand that! Sorry to hear about the Great Molasses Incident–no fun at all. For those who like to peruse the aisles of discount kitchen wares, allow me to recommend Home Goods. They are the TJ Maxx home department blown up (serve ware, appliances, furniture, linens, and yes, cookware). I have found copper Mauviel pots, le Creuset dutch ovens, and other treasures as well. Go and shop! The more we go, the better it will be. Oooh all of those rich flavors are great. Nutella is good in anything! This is a fairly sad thing to admit and my excuse is that I went gluten-free in the summer, when I mostly make Scotcheroos, but…butterscotch chips were one of the first processed ingredients (I don’t use too many) that I investigated, only to find out that yes, the gluten is hidden in them. I should check Stop & Shop’s brand, if they have them. I was just excited to find GF rice cereal to replace Rice Krispie’s! And now, another family sin…Rice Chex are now gluten-free and my 13 year old son is an expert at making Puppy Chow. Melt chocolate chips and butter and peanut butter, mix well. Carefully toss the cereal in the mixture, then coat well with powdered sugar. It was a preschool treat he hasn’t forgotten. Back in the day, we’d replace the Puppy Chow bag with the cereal bag and serve “puppy food” for a snack. It’s terribly addictive! Hi, David! 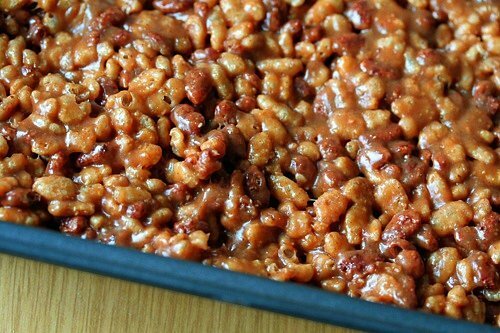 Scotcheroos are a family favorite for me, and they’re ridiculously simple — one cup each sugar and corn syrup are brought to a boil with a tablespoon of water, then removed from heat; one cup peanut butter is whisked in, and then all the glorious mix of stirred into six cups puffed rice cereal. Your version looks just amazing, and I look forward to trying it. You. were. ten. miles. from. me! Had I known I would have paparazz-ed you! And followed you through Ross. What a sight that must have been. Hi Alison: If you scroll up the comments, you can see I wrote a bit about the molasses available here in France. I also talk about the difference in my post about American baking ingredients, too. And kudos to you on homemade cornbread! Whoa, totally not healthy. But looks so good! I’ll have to try this one out. Cool blog by the way. These are awesome. I enjoy rice krispie treats, but these are so much better. I’ve made them twice, and everyone who’s eaten them has loved them. You could probably enslave masses with this recipe and have your own horde. Who knew–puffed rice! This totally looks yummy. I really would love to try and make this. I’m also jealous that you are in my favorite city. Soon I’ll visit again. Thanks for the great blog! Anything with Nutella has to be good, right? And, I tried the sugared puffs — they were awesome! I made them in regular muffin tins the first time, but have since acquired a popover pan since they will become part of my regular baking rotation! I enjoy your blog and recipes and was excited to make these. But they ended up more like “Brick-a-roos”. After they cooled, we had to get our most sturdy knife and put all of our combined muscle into cutting them. Eating was for molars only, though they softened nicely in the microwave. If this is different from the experience of others, the only thing I can think is that we used an organic version of Cocoa Krispies from Whole Foods – a little bigger and crunchier than plain old Rice Krispies. Stick with the real deal or beware! Did my CIA pastry externship at Chez Panisse a few years ago, and I’m betting that you’re right about Lindsey Shere having some very specific things to say about scotcheroos. As I recall, butterschotch chips and peanut butter might as well be non-existant in the land of pastry perfection! You had me at cheesecake brownies and now this just makes my day. Dying to make this treat. Just waiting on my butterscotch chips to arrive from the states…then I’m one big scotcheroo! It is seriously criminal that you make all these decadent treats and stay so svelte! Seriously, seriously. I’d be a butterball for sure. Louise: Nope. It can be stored at room temperature. Made these yesterday to go into my three kids lunch boxes for the following school week. They didn’t make it. Thats right, the entire batch consumed by our family of five as well as a few neighbor hood kids. Don’t fool around with the recipe, make them the way its written and you’ll have a great treat!!!!!! Oh these looks scrummy. I am looking forward to trying them. Just so you know, I am sure You would get the butterscotch chips in paris, I am in the UK, and I get them for my baking. If you need a helping hand, just let me know. As an american too living aboard, I ALWAYS take 2 cases home for a visit and come back with 6. Go figure!! And I agree with the comment earlier someone made, liquids always got in a bag. Saying that I had some tea spill out in my bag, it was like I dragged them through some beach before bringing them back home!! Loving this site and your recipes. BTW made your cheescake brownies today!! Uber Yummy!! Not too sure they are to the british taste though. Just made these and used brown rice syrup and they were soooo good!! I should have waited to make them for a party though because I was forced to eat the whole thing. They are super sweet but if you are in the mood for something rich and sweet and gooey..this is the ticket!